Got a question for next month Q & A -> use the form! You mentioned DOMS in regards to running, but I’d like to know more in regards to cycling. I’m a masters cyclist and I seem to get a horrible case of DOMS a few times a year. I never bonk or cramp during events, but after races (not training) I sometimes get DOMS a few days after a very hard race. My glutes, hamstrings, quads, ITB, hip flexors all get inflamed and then my lower back starts to seize and I can’t walk, bend over etc.Any thoughts on preventing this? Is this a post race hydration issue? Massage, cool down, recovery ride? Supplements, electrolytes? a) making sure you are conditioned for the intensity and demands of the race is first response when I deal with cramping, back pain or excess soreness. b) making sure to cool down and maybe even a recovery day spin may help as well but also making sure not to overdo it the day or two after, don’t rush back! You might just need a recovery spin the day after and then an off day 2 days out. It is often tempting to go back to the regular, textbook schedule but the body may not go on that rhythm. c) if you are taking any anti-inflammatories during or after the race that would also be something to avoid to make sure you are not masking symptoms, and again be getting feedback on how your preparation was for that event. 1) A lot of times a good warmup/cooldown will help … make sure not going hard immediately and not giving some time to get body cooled down at the finish. 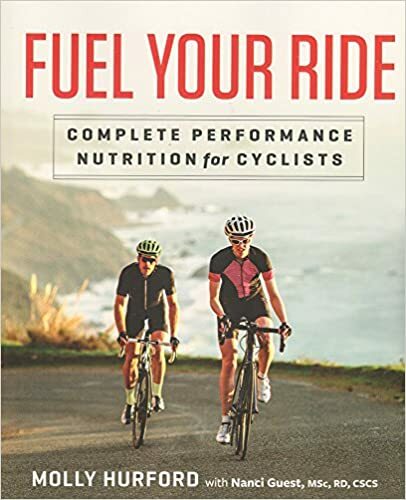 2) more calories in ride and/or around rides -> don’t skimp on in-ride fuel (this robs your work capacity too) and also don’t skimp after the ride. Other meals can certainly be more protein/veggies if trying to reduce calories/increase nutrient density. Any or all of those 3 are common causes of cycling soreness in the absence of very hard mountain biking (eccentric loading/pounding) or crashing. QUESTION: Sarah asks about Macro-Nutrients and how much good nutrition will improve performance? => Many options depending on genetics, goals, body type, age and gender. => Performance improved by optimal body composition, sleep, mood and energy which are all a result of good nutrition. QUESTION: HOW TO MAKE SWEET POTATOES? -> Many microwaves have a ‘potato’ button … press it twice and put 1 potato in and it almost always will be pretty close. Add a minute or two as required at end. -> bake 4+ while making another meal and keep them in a Tupper-ware! -> don’t over cook them (ie. to the point there are juices running) as this usually is not as good the second day when you reheat or eat cold. -> for some reason these are more delicious and easier to handle on a grill then ‘chip’ cut.